I recently became the proud owner of a Raspberry Pi Zero. An amazing little gadget for its $5 price point! But as a result the features are a bit spare. When I found this RPi WiFi project on Hackaday I was hooked, I needed to have one. But it's not available, yet. The original project is more ambitious than my adaptation of it. I only put the ESP module and a breakout for (power and) serial data. 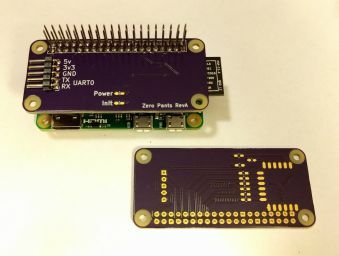 A stacking header mates with male header pins attached to the Zero, and voila! The original seemed to be called "WiFi Pants", with my simpler version intended to work with the Pi Zero, I chose to call mine "Zero Pants". Remove the kernel module first, then toggle the GPIO pin to cause the ESP to restart. The module automatically reloads itself, and if you have a valid wpa_supplicant.conf set up, it connects in just a few moments. Plus I needed to patch the esp8089 module to get it to compile for the recent kernel I got by following the instructions. (As mentioned in the comments.) But hey, it was a nice fun small project! I ended up not installing either of the LEDs in this, the second module that I assembled. I got something wrong so the power LED was unnecessarily bright, and the "init" LED did indeed blink correctly to let me know the GPIO was twiddled. But it's normally high, so stays on the whole time, and also terribly dim, because it's being powered through the (I assume?) processor's internal pullup resistor. So no need to keep that! As of a recent update the kernel driver does all the work to load without any need for the script above, even better!